Welcome to our second annual K9 5K Walk/Run that will benefit animals in need in the Dickinson area. 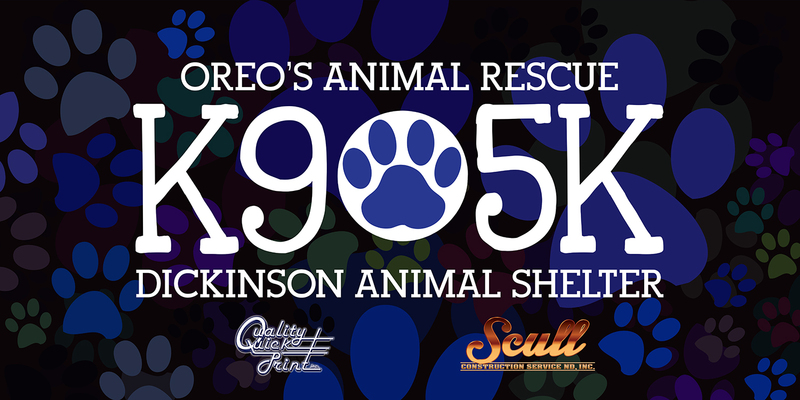 Proceeds from the race will go towards the care of the animals at the Dickinson Animal Shelter and Oreo's Animal Rescue's foster homes. Money raised helps pay for food, spaying and neutering of the animals, vaccination costs and any other additional medical costs for the animals. We encourage you to bring your dog(s) to run or walk with you. This is about them and promoting exercise for your pets. The race will start at the Dickinson Dog Park/Gress Softball Complex in Dickinson, ND. Registration and check-in the day of the event at Gress Softball Complex, 455 8th Ave SW, Dickinson, ND and will begin at 7:45 AM and ends at 8:45 AM. Walkers' shotgun will follow the runners at approximately 9:05 AM.